Alongside the Promoting Safer Building Pilot Project, Habitat for Humanity GB and CARE International UK have funded a comparative review of evaluations and learning documents from the shelter response to super typhoon Haiyan in the Philippines. Click here to download the full report or briefing paper. On 8 November 2013 super typhoon Haiyan (known locally as Yolanda) devastated the central regions of the Philippines. More than 6,000 people lost their lives, 14 million were affected and approximately four million displaced. A total of 1,012,790 houses were damaged or destroyed by the super typhoon – 493,912 partially damaged and 518,878 totally damaged. Within a month of the typhoon almost 80% of households had already started rebuilding their homes but around 50% said they would be unable to complete repairs without assistance. In March 2014 the Shelter Cluster’s Strategic Operational Framework identified ‘support for household self-recovery’ as one of its three strategic objectives. By October 2014 approximately 160,000 households had received support for ‘repairs and retrofit’ (or SSSR) while organisations had confirmed funding to support a further 80,000 households. The majority of these programmes were completed within the first 18-36 months of the response. 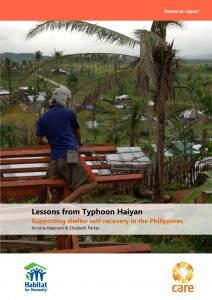 Collectively the six programmes included in this study supported 76,407 households or around one third of the 240,000 households assisted by agencies reporting to the Shelter Cluster during the response to super typhoon Haiyan. The number and diversity of SSSR programmes implemented following super typhoon Haiyan provides a unique opportunity to capture lessons, challenges and best practice. Drawing on lessons from previous research by the authors into SSSR this study adopted a simplified evidence synthesis approach. This involved: searching for and screening potential documents for inclusion; extracting and synthesising data; reporting and review. The research was completed between November 2016 and February 2018. SSSR programmes have the potential to cost-effectively and rapidly assist a large number of households. ‘Self-recovery’ does not have to mean ‘self-building’ – instead, supporting shelter self-recovery involves helping households to make and implement key decisions about their housing recovery process. SSSR programmes could be part of a tiered system of support (such as training, SSSR and ‘SSSR Plus’ or direct-construction) to households with different levels of need. Providing a combination of material, financial and technical assistance is critical to the success of SSSR programmes. SSSR programmes should be integrated with livelihoods and WASH programmes (where it is culturally appropriate). Assessment of the needs, priorities and capacities of households and communities, as well the availability of labour, materials and land is necessary so that the most appropriate combination of assistance is provided.